This pack is no longer offered by Isagenix. The Healthy Lifestyle Pak is being replaced by the Isagenix Healthy Maintenance System as of April 19, 2017. At Isagenix and IsaTrim NZ, we believe that being healthy is a lifelong goal. Instead of selling fad diets or temporary fixes, we work to ensure that each product is a part of a healthy lifestyle. The Isagenix Healthy Lifestyle Pak is ideal as part of a nutritional cleanse or to maintain your weight loss from previous months using Isagenix. If you have never tried the IsaLean Shakes before, you are in for a treat. These shakes are designed to be nourishing meal replacements. Whether you are on-the-go or just need a nutritious lunch, these shakes help to cleanse your body while they provide the nutrients that you need. Each component is designed to work perfectly together so that you achieve the best results. Stop looking for quick fixes and take a new approach to dieting. With the Isagenix Healthy Lifestyle Pak NZ, you can start on your journey to a healthier, happier life. 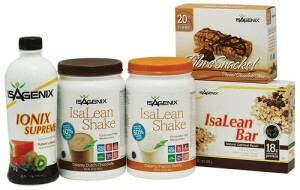 Every Isagenix product that is sold comes with a 30 day money back guarantee. This means that you can return Isagenix without any questions asked within 30 days from the purchase date.